An LVN to RN program is structured specifically for a licensed vocational nurse (LVN) who is interested in obtaining certification as a registered nurse (RN). As well, these programs can be for current registered nurses who are simply interested in obtaining more education in order to pursue advancement in their organization, in addition to salary increases. A nurse can earn a Bachelor of Science in Nursing (BSN) through these types of programs. After earning such a degree, she can opt to either continue her education by working towards an MSN, or head back to practicing in a healthcare organization. A registered nurse typically commands a higher salary than a Licensed Practical Nurse, and rightly so as a registered nurse has studied longer and has more knowledge than either an LPN or LVN. A nurse who has completed advanced education programs – often earning a BSN degree or an MSN degree – stands to make a significant amount more than someone without a college degree. 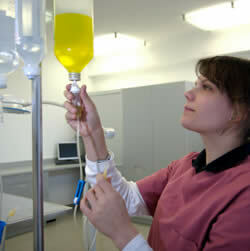 An average salary for a registered nurse is typically in the range of $50,000 to $75,000 annually. Some nurses make up to $90,000 a year. Many accredited academic institutions offer LVN to RN programs. There are many routes one can take to becoming a registered nurse. While LPN to RN programs are excellent, there are also degree programs available that offer students the chance to obtain a Bachelor of Science in Nursing, or a Masters in Nursing degree. LVN to RN: A licensed practical nurse who is interested in becoming a registered nurse will benefit most from this type of degree program. Students in this program will be given the knowledge, and skills needed in order to take the NCLEX Examination. Passing this exam will enable them to begin practicing as registered nurses. LVN to BSN: This degree program is aimed specifically at licensed vocational nurses (LVNs) interested in learning about essential topics in nursing, including patient care, basic health care management principals, and more. LPN to BSN: Best for a licensed practical nurse (LPN) interested in furthering her career by obtaining a bachelor’s degree. LPN to BSN courses deal with many subjects across the nursing spectrum. Graduates will be aptly prepared to apply for jobs in the nursing field, or to seek promotions in their current health organizations. LPN to RN: A licensed practical nurse (LPN) to registered nurse (RN) program is tailor-made for nurses who want to complete LPN to RN courses that will enable them to have an advantage in the hiring and promotion process over their peers. Courses will focus on the essential areas of nursing, including preparations for the NCLEX Examination. RN to BSN: Being an RN is a highly rewarding career decision. It should be noted, however, that without a degree from an institution of higher learning, there can be barriers to promotion within a single organization. This can be solved by pursuing a BSN degree. Being a BSN degree holder by completing RN to BSN courses can result in a pay increase, as well as improved career opportunities. A number of accredited institutions of higher learning offer LVN to RN degree programs. Some programs require a significant amount of in-class study. Others offer the option of completing the LVN to RN courses online. 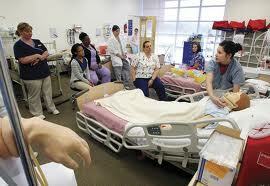 This type of online nursing degree is beneficial for a student who has other family commitments, or a job. He can study and work in the comfort of his home, and still look after his family. Indiana State University is currently the only university that offers an online LPN to RN/BSN degree program. Kaplan University where students interested in becoming registered nurses can enroll in degree programs such as an RN to BSN program, an RN to MSN program, an MSN Nurse Administration program, and an MSN in Nurse Education. Florida Hospital College of Health Sciences focuses on providing an education for students in medical fields – and aids students who are serious about working in health care organizations. Students can enroll in an RN to BSN degree program. University of Phoenix is the largest online university in the world in terms of enrollment and provides students with many different program options at all levels of study in the nursing field, specifically RN to BSN, MS in Nursing, and PhD in Nursing. Azusa Pacific University offers an excellent accredited degree program option for interested nurses: LVN to RN or LVN to BSN, which takes two years to complete. San Joaquin Valley College, an accredited private junior college that offers accelerated career-focused curriculum and instruction for nursing students – LVN to RN program offers nurses a chance to complete coursework that will prepare them to sit for the NCLEX-RN program. Chabot Collegeoffers a program designed to assist LVNs to achieve eligibility to sit for the National Council Licensing Examination for Registered Nurses. Mendocino College has an accredited LVN to RN bridge program tailored for a student interested in furthering his or her nursing career. More details on Mendocino College below. National University offers a program for LVNs who want to complete the minimum number of units needed to be able to sit for the licensure examination. The LVN to RN degree covers a variety of topics and concepts essential to the nursing profession. It is unfortunate that many students who want a career in the nursing profession opt out of the LVN or LPN programs in the mistaken belief that there is no financial or other aid. There is assistance for those who can prove need and who qualifies. There is also the FAFSA. Once the FAFSA is completed, the scholarship search can begin. There are a variety of scholarships available for nurses and those interested in LVN to RN programs. Some of these scholarships include, Discover Nursing Scholarships, American Health Care Association Scholarships, National Black Nurses Association scholarships, Nursing Student Loan Program and Scholarships, and more. The first semester of LVN-to-RN Bridge coursework consists of a transitions course (NUR 50) in which LVNs are instructed on issues of role transition, concepts of Nursing Diagnoses, and critical thinking concepts. Skills competencies are evaluated in a separate lab course. It is strongly recommended that students have some recent acute care medical-surgical experience as a licensed vocational nurse before starting this course. A math exam consisting of dosage calculations is also given. The exam must be passed at a grade of 90% or more in order for the student to continue in the program. The second semester involves twelve clinical hours and two lecture days (approximately 5 hours per day) that also have an open skills lab component (3 hours per week). The clinical day involves travel to outside facilities. Transportation is the student’s responsibility. Clinical sites may require considerable driving time so dependable transportation and funds are required to cover fuel costs and auto repairs. Courses include Complex Medical-Surgical Nursing, Leadership and Management, Nursing Seminar and Pharmacology. The third semester involves clinical hours, which vary between one 12 hour shift and mini-intensives where three or more shifts are done over a short period of time at distance learning sites, as well as two lecture/lab days (approximately 5 hours per day). Courses include Complex Medical-Surgical Nursing, Advanced Leadership and Management, Mental Health Nursing, and Advanced Nursing Seminar. All of these are online programs. Many of the universities also have on-campus programs. You now have a place to start. Being a Licensed Practical Nurse is a great job, but if you want to further your nursing career then you need to improve your qualifications, and one great way of doing that is to do a LPN to RN program, which will let you become a qualified Registered Nurse with a far better salary and huge career prospects. When considering this option, remember to look at all alternatives, including an online LPN to RN program like the one offered at Northwest Technical College. Do thorough research on the Internet and see what is on offer, but make sure that whichever institution you choose, it must be an accredited institution otherwise you will be wasting your time and money as you cannot register without an accredited qualification. This review will give you some insight into what you can expect from a reputable institution such as Northwest Technical College’s online LPN to RN program. This way you can see what Northwest has to offer and what you should look for in any other program. Once you have done your research you will be able to make a decision as to which program will best suit your circumstances. In the early sixties, Bemidji High Schoolteacher, Jake Outwin, realized that a workforce with the practical skills and knowledge needed for professional opportunities was needed in the area. He led an effort, with the support of the state of Minnesota and the local community to establish the Bemidji Area Vocational Technical Institute in 1965. This was a two-year college which initially only had two programs, automotive mechanics and carpentry. Since then the college has evolved and gone through a few name-changes. They introduced new programs in child development, business, medical, and other technological fields, in order to satisfy the ever-changing needs of its learners, the state and the nation. In order to ensure that their students only received the best in education, the college employed resourceful and creative professionals with incredible talent and a dedication to educating. Slowly but surely the profile of the students attending NTC changed from young white males to a diverse population of men and women of various ages, ethnicity and nationalities. So NTC was transformed into a modern learning environment, where students are given a professional technological knowledge base that is leagues better than what they would get from many other similar institutions. The Northwest Technical College is famous for its adoption of the American Indian spirit and legacy of respect for tradition and the natural world. NTC is the only college that has added this unique dimension to its programs that is specific to the American Indian and of such importance to the future of the U.S. commerce and culture. NTC also has a satellite campus that is part of the Red Lake Indian Nation community. NTC is in partnership with Bemidji State University, which extends unique four-year university resources to the NTC community. This is the only partnership of its kind. Northwest believes in integrating the value of work with the educational experience, thereby developing resourceful lifelong learners with the knowledge, skills and attitude that enable them to secure careers that are extremely rewarding and lives that are ultimately satisfying in the technological, diverse global society of today. Northwest Technical College is guided by a commitment to excellence through education with a global focus, thereby becoming the premiere technical college in Minnesota. Their curriculum and culture helps to instill an appreciation of self and others and is a life-enhancing experience for all. The LPN to RN program is also known as the AS in Nursing (ASN) program, and is what is known as a “mobility program” in that it allows the LPN to advance knowledge and skills for licensure and practice as an RN. The program is approved by the MnSCU system and Minnesota Board of Nursing. Students will receive supervised learning experience in caring for patients in a various health care settings, such as hospitals, physician clinic settings, or long term care facilities and more. All required courses must be successfully completed in order to obtain the AAS degree. Upon successful completion of the online LPN to RN program, graduates may apply to take the NCLEX-RN exam. Once they have passed this examination they can register and practice as a Registered Nurse. NTC has an agreement with the nursing program at Bemidji State University whereby graduates who so wish may continue their educational advancement through the Baccalaureate Degree completion program. Admission to the online LPN to RN program is achieved via a competitive admission process. Each application is afforded a number based on a 23-point scoring rubric. Applicants with the top rubric scores are admitted to the program. You can find out more about this on the NTC website. In order to complete an online program of study you need to be very confident that you have what it takes, because it is not easy for everyone to study on their own without the benefit and discipline of a classroom scenario. If you are self-disciplined though, this is the best format for you to study for your LPN to RN as it allows you to continue working and study at your own pace and at the hours that suit you. NTC offers great support and interaction for their online students. They offer free tutoring services to assist you to refine your writing and communication skills and boost your math skills and study skills. You will have access to all the resources that you need in order to make your online study experience a happy one. You can purchase Microsoft® Office 2010 Professional from the campus bookstore for $25.00 if needs be, and if you are worried about the financial implication, it can be charged to your financial aid. All students doing online program must ensure that they have current and active virus protection installed while making use of the College’s network. Virus protection can be supplied by NTC at no cost, if necessary. Warranty: Students are strongly encouraged to purchase a two year warranty; or longer. These are highly recommended so that you can back-up any data and not stand the chance of losing important work should your laptop have problems. In order to enroll for the online LPN to RN Program there are certain documents and qualifications that you need to submit and without which you will not gain admission to the program. Assessment in math is required, but is waived in reading and writing for ASN applicants. Waivers may be granted in some cases. From a state approved diploma or AASPN program from a regionally accredited university or college within the last two years; alternatively a letter from your employer verifying the equivalent of six months of full-time employment as an LPN in good standing. The GPA will be calculated using combined cumulative GPA from all previous post-secondary education. Applicants who are on academic suspension or probation will not be considered for admission. One semester of college chemistry with a minimum of 3 credits and a grade of C or higher. Must have been done within the past seven years OR you must have done at least one refresher course such as Anatomy, Physiology II or Advanced Physiology within the past seven years. The Consent to Disclose/Allied Health Division Student Data form must be completed and on file. You need to have an unencumbered LPN licensure upon acceptance. Background study completion: this must be done upon program entry and annually thereafter. Evidence of your “clearance”, or approval to provide healthcare must be on file prior to any clinical courses being undertaken. You must have current CPR Certification – either the American Red Cross CPR for Professional Rescuers or the American Heart Association CPR for Healthcare Providers. This certification must be kept current throughout the program. The AS Nursing program at Northwest Technical College has a “competitive admission process” which you should read on the website prior to applying for admission into the program. The AS Nursing degree requires 64 total credits. Tuition is a very important aspect of any program, and it is necessary that you know what you are letting yourself in for before you enroll in a program. That being said, do not let the cost of the course be your only yardstick by which you select or discard a college or university. Sometimes excellent institutions do not charge that much considering, and other times those institutions whose programs are not that great charge exorbitant fees purely on reputation. At NTC, various fees are assessed to learners depending on their enrolment status, services offered and courses. The following is a list of fees that may be assessed. Your course prerequisite list will denote any fees that are unique to that program. You can get a fee schedule from the campus business office for the current academic year. Scholarships are awarded on a merit basis, and if you have top marks then you could be eligible for one. Scholarships do not need to be repaid, but you may have to maintain a certain grade average. For more information regarding scholarships you can look on the NTC website. 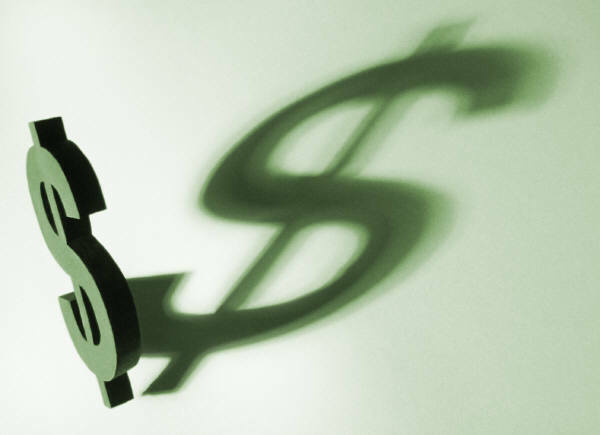 Federal grants are awarded on the basis of financial need, and do not need to be repaid. In order to apply for financial aid you will need to complete and submit a free FAFSA form. Be sure to get your application in early or you may miss out on aid that you are eligible for, because of the vast amount of applications for federal aid. There are also government-subsidized loans available which you only need repay a part of. When looking into improving your career prospects in the nursing field, one of the options available to you is to do an Online LPN to RN Bridge Program such as the one offered at Hutchinson Community College. Although there are a number of online programs available, it is important that you ensure that you do sufficient research into which will be the best institution for you to study through. Be sure to only do your courses thorough institutions that are reputable and are accredited or you will be wasting your time and money. The most compelling reasons to study to upgrade from a Licensed Practical Nurse to a Registered Nurse is the fact that you will earn more and will have far more employment opportunities. Getting your licensure as a registered nurse is also only the first step in the many that you can study for in order to work your way up into a position of seniority in the hospital or institute at which you are employed. The aim of the following article is to give you an insight into the online LPN to RN Bridge Program offered by Hutchinson Community College as part of your research into the best online program for you. Hutchinson Junior College was established as a newly constructed addition to Hutchinson High School in 1928, with a total enrolment of 187 students. In 1938, the Board of Education acquired land on Plum Street and built Lockman Hall, after which the college continued expanding as needed, to include various other buildings and sports fields. In 1965 the college changed its name to Hutchinson Community Junior College, and it was subsequently changed again to its present name in 1980. Hutchinson Community College merged with the local vocational school in 1993 and was renamed Hutchinson Community College and Area Vocational School. The college has two off-campus sites, Newton and McPherson, and the licensed practical nursing program is offered by HCC at McPherson Memorial Hospital. The college website has loads more information and you can schedule a tour of the facilities or even take a virtual tour right there on the website. The Online LPN to RN Bridge Program at Hutchinson Community College is one of the most comprehensive Online LPN Programs available. An LPN may request advanced placement in the Associate Degree Nursing Program, and HCC encourages Individuals to contact the director of the program in connection with this. The program is very popular so it is important that you get your application and all required documentation submitted as soon as possible. Remember that is you should end up on the waiting list you need to continue to meet all the admission requirements so that you can be admitted to the program should an opening arise. The award is an AAS award, which is an award that requires at least 2 but less than 4 years of full-time equivalent college work. This degree requires 64 credit hours. Graduates of an accredited high school or the equivalent are eligible for admission to HCC. Students who do not meet college entrance requirements may enroll with special permission. Admission to the Online LPN to RN Bridge Program is granted by the selection committee, who meet on an as-needed basis. You can apply to be accepted into the Online Bridge Program March 1 through July 30 for the class starting the following January. It is in your best interest to ensure that your application is completed and submitted in time. HESI Entrance Exam: You must successfully complete the entrance exam before being admitted. You may take the exam twice during an application process. Application to HCC: Submit an application for admission to Hutchinson Community College. This can be done at www.hutchcc.edu/admissions. Application to OBP: Submit an application for admission to the Online LPN to RN Bridge program between March 1 and July 30. Criminal Background Checks/Drug Screening: All students seeking admission to a nursing program will be required to submit to a complete background check. The cost of the background check is the applicant’s responsibility. Appointment: Schedule an appointment with Nursing Program Director or Faculty Member. Selection Criteria: Every phase of the admission process is evaluated according to a point system. A sample of the scoring sheet for this is available upon request. Applicants will be ranked based on the total points received. Waiting List: Students who are put on the waiting list must continue to meet all admission criteria in order to be eligible to fill vacancies if they become available. You can do your LPN to RN Online Bridge Program at hours that suit you; after work or on weekends for instance. It is good to bear in mind that online study is not all sunshine and roses though. To be able to complete a program online you will need to be very dedicated and self-disciplined as it may not always be easy to study alone or when everyone else is out having a good time. In order to study online you also need some technological equipment such as a laptop or access to a computer, a fast Internet connection, e-mail access, and at least a basic understanding of how a computer, the Internet and various programs work. Many individuals are a bit technophobic, and this puts them off of doing online courses, which is a great pity. Fortunately most online schools offer an interactive learning platform for online students, and at Hutchinson Community College this is the student portal Dragon Zone. Here you will be provided with email, online courses, transcripts, information about important campus announcements, schedules, account balances and other services, news, books, and events. Dragon Zone is a very interactive platform that gives your online learning experience a personal touch that you may not find as easily at other online schools. In order to be accepted into the LPN to RN Online Bridge Program, you need to satisfy certain requirements over and above what you need to do to gain entry to Hutchinson Community College, as detailed above. IS103 Microcomputer Literacy class may not have been taken more than five years ago. It is important that you know what the fee structure is when applying to do an online LPN program, although you should not just base your vote on the cost of the program as the most expensive is not always the best and vice versa. Hutchinson Community College has one of the most reasonable tuition and fee structures in the state of Kansas. There are various scholarship opportunities, financial aid and work opportunities, and the college is very willing to assist anyone who needs financial aid to assess it. Due to the fact that HCC has such a diverse body of students, it offers a wide range of scholarships for both full-time and part-time studies. These scholarships do not need to be repaid although some of them may require the student to maintain a certain level of academic success. You can access various grants for your studies at HCC. Many of these are government grants, and you will need to complete a FAFSA in order to access them. An education loan must be repaid with interest and eligibility is generally though not always based on financial need. Federal student loans come with limits as to how much aid a student can receive and the maximum fees and interest rates charge is set by Federal law. Eligibility for Federal Financial Aid is determined for students who annually complete the Free Application for Federal Student Aid (FAFSA). Students who require Federal Financial Aid must complete a FAFSA annually, and it is recommended that you get your application in early as award packages are determined as early as March for the upcoming academic year. You will only be eligible for those packages that are available at the time that your application is fully processed and only if you meet eligibility requirements. You must be enrolled at HCC in a degree-seeking major and meet HCC’s Enrolment Requirements. You must make satisfactory academic progress as stated in the HCC policy. You must complete and meet FAFSA eligibility. Ensuring that the college at which you study is accredited is very important, as you will not be able to sit for the NCLEX licensure examination unless you qualify from an accredited institution. This means that apart from the fact that you will not find employment, as most employers insist on graduates from accredited institutions, you will essentially have wasted your time and money. Hutchinson Community College is accredited by the Higher Learning Commission (HLC) which is part of the North Central Association of Colleges and Schools (NCA).